The Securities and Exchange Board of India (SEBI) has commenced conduct hearings from Wednesday on the show-cause notices (SCNs) issued to a total of 25 entities and individuals in July 2018. There were two sets of SCNs issued. One related to the abuse of the tick-by-tick (TBT) system (eight entities) and the other related to dark fibre (17 entities). Included in the noticees were former managing directors Ravi Narain and Chitra Ramkrishna. While all the 'noticees' were asked to be present in SEBI Bhavan in Mumbai on Wednesday and Thursday, it appears that SEBI was only interested in questioning National Stock Exchange (NSE), for now. In all cases, they were represented by their lawyers. NSE was represented by AZB & Partners and Somasekhar Sundaresan. Interestingly, the lawyers representing former managing director Chitra Ramkrishna and Anand Subramanian were absent. 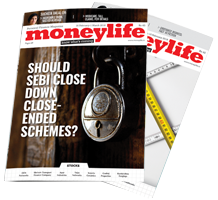 The colocation or algo scam came to light in mid-2015, when Moneylife wrote about it for the first time, following multiple letters from a whistleblower. For this, NSE had filed a defamation case against us. A single-judge had penalised NSE for Rs50 lakh for having filed a case against us. After filing an appeal against the order, NSE paid up the penalty. Meanwhile, in the wake of the scam, the top brass of NSE had to resign and a new management team took charge. In May 2017, SEBI issued its first set of notices to 11 entities, even as NSE had filed for consent mechanism. In July 2018, a second set of notices was issued, after SEBI recorded statements of various NSE officials, brokers and others involved. SEBI’s SCNs were backed by three detailed reports: SEBI’s technical advisory committee (TAC), NSE-appointed forensic auditor, Deloitte Touche Tohmatsu India LLP (Deloitte) and, finally, an independent audit by Ernst & Young, all established wrongdoing. The first SCN on TBT was based on investigations that certain brokers could get advantage in connecting to the NSE’s servers because the Exchange had faulty systems. The reports said Delhi-based OPG Securities was consistently able to connect to NSE’s trading system ahead of other trading members, as alleged by the whistleblower’s letter. The TAC also found that the architecture of NSE with respect to dissemination of TBT through TCP/IP was prone to manipulation/abuse. (Read: TAC Report Proves Systemic Lapses at the NSE). The second set of SCNs alleges that NSE has undergone practices of denial of services to certain stockbrokers resulting in discrimination and non-adherence to principle of fairness and equal opportunity by allowing Way2Wealth (W2W) and GKN Securities to terminate the connections directly in the rack placed inside the Exchange’s co-location facility. This, the SCNs says, is in complete contradiction to normal practice followed by NSE. W2W and GKN were allowed to establish P2P connectivity through service-provider Sampark, while many stock brokers, who desired to lay P2P connectivity through providers other than the four mentioned in the NSE circular on 31 August 2009, were denied permission by NSE staff. It has also been alleged that NSE lacked a clear documented policy for due diligence of service-providers by checking their licence while allowing P2P connectivity. To make matters worse, NSE allowed W2W and GKN to continue to avail Sampark connectivity even after finding out that Sampark did not have the requisite department of telecommunications (DoT) licence. Furthermore, in the process of providing connectivity, a site inspection was conducted for other stockbrokers such as Millennium, GRD and SMC while the same procedure was not followed for W2W and GKN. NSE has been trying to go for a consent order to 'put the past behind' and launch its initial public offering (IPO). The IPO has been on hold and SEBI has returned NSE's consent application, citing pending investigations in the algo scam case. Does the regulator monitor the TV channes at least when one complains, some of whom clearly show a bias instead of reporting news as it emerges. Some times they do wonderful job in asking questions. They should have some sort of code of ethics and restrain from asking the promoters market sensitive information by putting up a leading question. 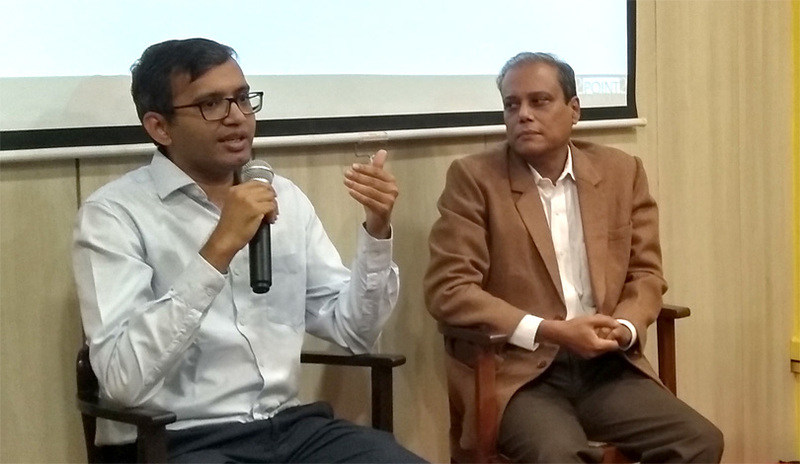 A recent seminar at Moneylife Advisory Services (MAS) addressed an issue that agitates investors and ought to worry regulators: “How To Spot Red Flags about Management”. Amit Mantri, partner of 2Point2 Capital, started the presentation with two interesting images. A Snakes & Ladders board to depict investment traps and, second, the cover of Harry Markopolos’s book No One Would Listen which became famous only after Bernie Madoff’s ponzi scheme finally collapsed during the global financial crisis. Until then, Markopolos had written to everybody who mattered in 2001, 2005, 2007 and even in 2008, drawing attention to the fraud; but, as his book showed, no one would listen. The fact that Madoff was sentenced to 150 years in prison in 2009 is no comfort for millions of investors who lost their savings. The US government’s effort have led to $1.2 billion being paid back to investors over 10 years, while the losses, according to a New York Times article, were a massive $65 billion in paper wealth and $17.5 billion in cash. It immediately brought to mind the collapse of IL&FS (Infrastructure Leasing & Financial Services), the massive 348-company conglomerate, that has defaulted on its massive Rs100,000 crore debt. 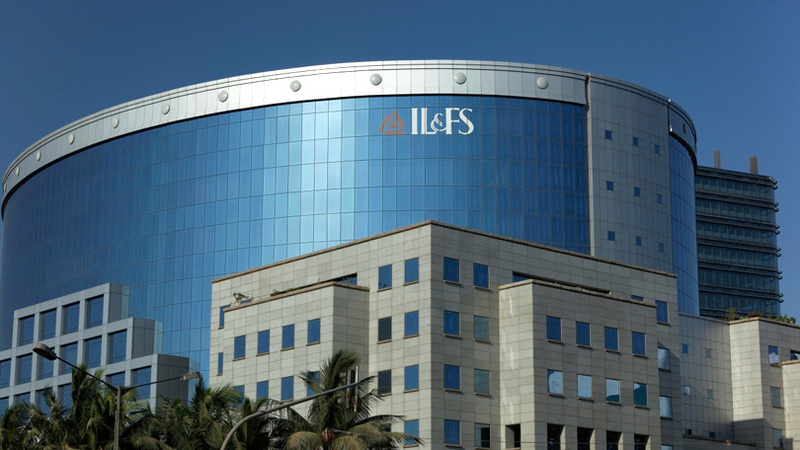 IL&FS, a favourite destination for officers from Indian Administrative Service (job-seekers and on deputation), managed to hide from everybody, including the government regulators, its financial jugglery and even the number of subsidiaries and overlapping businesses it had. In fact, when the board was sacked, the government press release said that IL&FS had 169 subsidiaries, when it turned out that the number was twice as much. 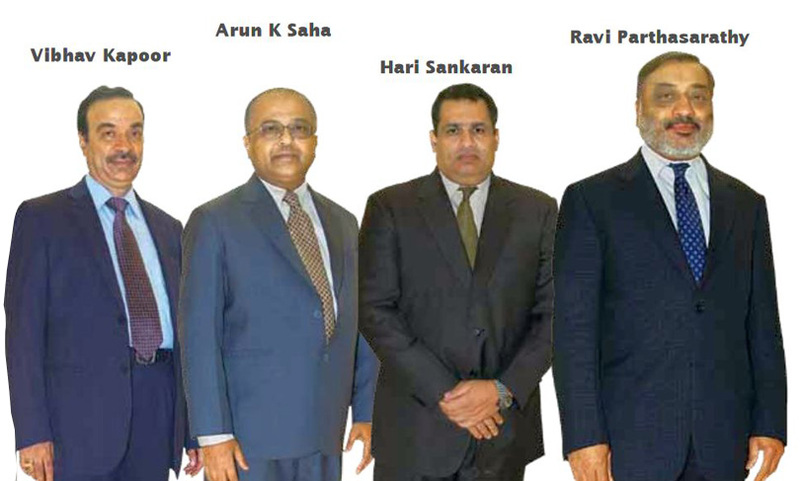 Here again, former directors like DC Anjaria (former audit committee head of GIFT City), high-profile victims, like Umesh Baveja (former vice-chairman of Cairn Energy and founder of RAHI Aviation), institutional investors like AIDQUA Fund of Singapore and an anonymous whistleblower, had written to the board of directors and regulators several times, over many years, but no one would listen. Even today, the cabal responsible for the debacle, led by founder Ravi Parthasarathy, Hari Sankaran, Ramesh Bawa, Arun Saha, Vibhav Kapoor and K Ramachand, seems to be getting away with its members’ systematic self-enrichment, while banks and investors face a minimum loss/ write-off of Rs30,000 crore and thousands of employees are set to lose well-paid jobs. IL&FS is not alone. Even Nirav Modi and Gitanjali Gems seemed to have operated with the blessings and support of regulators and politicians across parties. So the question that was posed to Amit Mantri at the MAS seminar was, ‘who is to blame for the failure to detect the fraud’? Is it the regulator, or does the buck stop at auditors and rating agencies? 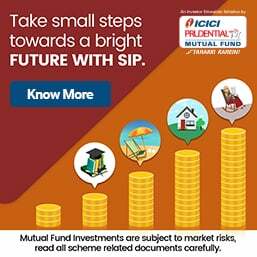 Mr Mantri and his firm shot to fame with an in-depth, on-the ground investigation into Manpasand Beverages, a high-flying company that made huge sales claims, until 2Point2 Capital exposed the hollowness of its operations. But, as Mr Mantri quickly realised, other than some reputational benefit, there are only downsides to serious investigation in India. The threats and harassment take the form of SLAPP suits (strategic lawsuit against public participation) for defamation (IL&FS used this effectively to silence people), exclusion from investor conferences and denial of access to research analysts and even direct threats. Moreover, when regulators are not held accountable for failing to respond to whistleblower complaints, they do not even deign to engage with them let alone offer protection or handhold them against vindictive action by promoters. Employees who dare to blow the whistle are harassed, like they are all over the world, while anonymous whistleblowers are simply ignored, unless the media highlights the issue (as in the National Stock Exchange algo scam case). Media houses like ours, that expose corporate fraud, suffer clear financial losses, especially when it involves corporates with large advertising budgets. They also face defamation suits or, at least, threats of legal action. Corporates involved in fraudulent activities are also working with image consultants to wipe the Internet clean of previously published reports about investigation and regulatory action against them. This includes misuse of the police machinery and the Information Technology Act to intimidate writers and analysts. Given the high level of corruption in India, misusing State machinery and the legal system for a small price is very easy. 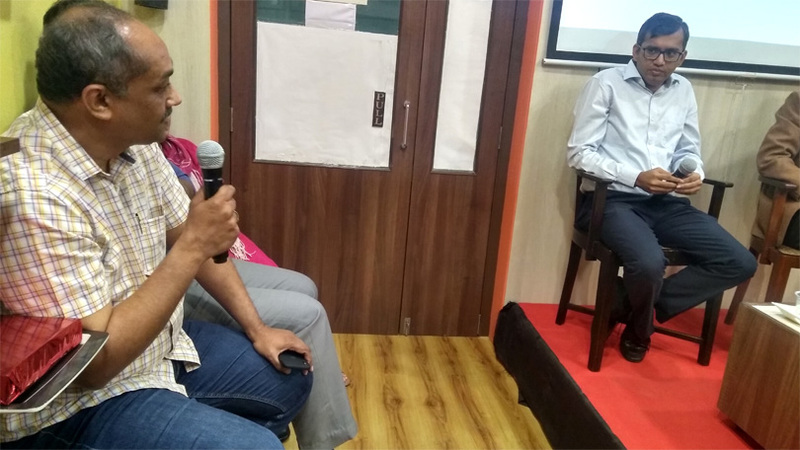 Well-known equity analyst, Ambarish Baliga, says that the reward for indulging in fraud and market manipulation is extremely high in India, while the cost of being caught is negligible. He was referring to a set of notorious and high-profile companies, which have successfully fudged sales numbers, their on-ground network, and even tax payments in order to pump up prices and play the market-capitalisation game. Many of these use round-tripped funds from tax havens to enhance their image. The Securities and Exchange Board of India (SEBI) has regularly permitted ‘settlement’ on payment of fine for a variety of frauds including insider trading. The regulator does not even issue speaking orders that disclose the nature or extent of misdemeanour and whether the fine levied is proportionate to the wrongdoing. In most cases, it is not even a slap on the wrist; this acts as an incentive for disreputable corporates to brazen it out. The best proof of this is that hardly any industrialist, other than a Ramalinga Raju (who confessed to a massive fraud himself) of Satyam and Dinesh Dalmia of DSQ Software have done any jail time—and both examples are over a decade old. In effect, there is absolutely no upside to exposing fraud. And, as Mr Mantri points out, our regulations do not allow short-selling, which would be a big incentive for analysts and investors in many developed markets for exposing crooked managements. A US study, titled “Who Blows the Whistle on Corporate Fraud?”, which attempted to identify the most effective mechanism to detect corporate fraud (it studied 216 fraud cases involving more than $750 million between 1996 and 2004), concluded that “monetary incentives for detection in frauds against the government influence detection without increasing frivolous suits, suggesting gains from extending such incentives to corporate fraud more generally.” It advocated better incentives for auditors, analysts and employees to blow the whistle. The study observed that journalists, who act as whistleblowers (accounting for 14% of cases detected), stand to gain in terms of reputation and better job prospects. The largest percentage of whistleblowers comprises employees, at 17%. Sadly, 82% of employees who blew the whistle lost their jobs. Among the other losers are auditors who end up losing accounts. The same study showed that short-sellers were responsible for exposing 15% of fraud cases and analysts 14% of them. They seemed to have a clear incentive to do so. The study recommends the need to increase incentives to specific players to expose fraud. These findings are nearly 15 years old and the global financial crisis has led to a significant increase in incentives to blow the whistle on financial fraud. 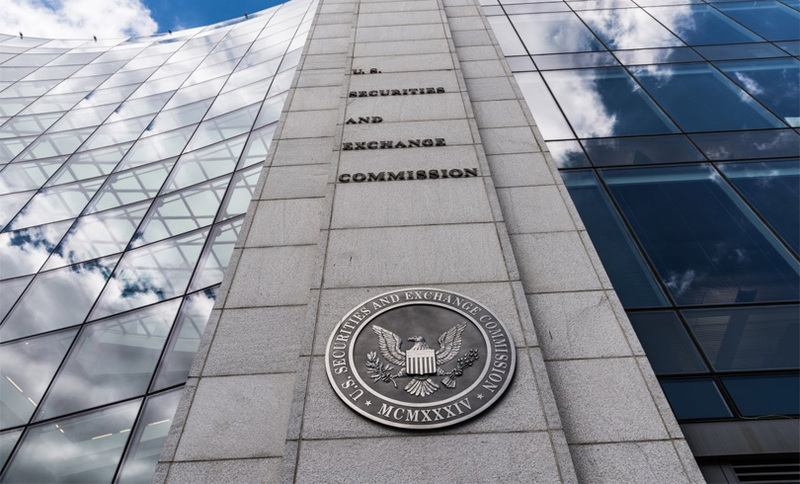 In the US, the Securities Exchange Commission (SEC) runs a successful programme which allows whistleblowers to file information directly, or anonymously through lawyers, and be rewarded as much as 10% to 30% of the monetary sanctions against the company. The reward is paid when SEC is able to carry out a successful enforcement action and for sanctions above $1 million. This makes the process safe and effective and prevents an India-like situation, where a set of lawyers lobby SEBI to ensure low penalties. In fact, SEC issued $168 million in awards to whistleblowers in 2018 alone. Today, a reward system had created significant incentives for employees and others to blow the whistle. This has led to serious disclosures in the healthcare and pharmaceuticals industry. In many case, the nature of disclosure is so extensive that corporates have preferred to settle, by forking out large penalties, rather than contest the charges brought by regulators. While employee whistleblowers are, often, motivated by morality and not merely monetary rewards, short-sellers are usually focused on profits. But, taking a contrarian position requires deep analysis, since they run the risk of making monumental losses. Consequently, they have, often, helped expose corporate misconduct faster than any regulator. Moreover, short-sellers, often, send their findings to regulators and help trigger official investigations into fraudulent activity. If the government wants to develop an early warning system for detecting corporate fraud and staunching crippling losses to the financial system, there is an urgent need to make regulators more accountable and create incentives and support systems for employees and journalists to blow the whistle. This can be through engagement with investigators and analysts, strong monetary incentives for whistleblowers and by permitting short-selling. The Government and its various arms/pillars are the biggest beneficiaries of crooked managements and thus to expect too much from the Government is not really viable. Annual meetings are no good either, with corporates positioning bouncers, and worse. In India, the only thing that works is loss of face, and that's where it starts from. The internet helps. The is lot of introspection required. NPA, corporate frauds are part of moral hazards and it seems that regulators do not have the will ( though they have powers ). Thank you for highlighting the issue. Deviations and corporate misgovernance are becoming a major issue and retail investors are the last one t know on fraud and insiders manipulation details, thereby getting trapped and loosing money. Wish Moneylife keeps a separate webpage as a database listing all companies that have indulged in such unlawful activities. Fantastic article. We need incentive to find out corporate frauds and report them. Many people are aware about such frauds but have no motivation to blow the whistle. An excellent article which not only exposes wrongdoings but also suggests solutions to catch the culprits and by making an example of them, reduce the overall chicanery. The solutions recommended are well known and there are ample examples of these bearing fruit. Then why are they not being implemented in India? Are the regulators in cahoots with the companies they regulate, or are they easily intimidated by political pressure? Do we need class action lawsuits which minimize individual liability and the lawyers are willing to take the risk after due diligence? Employee whistle blowers are the most vulnerable so it is a miracle that they exist at all in the corrupt environment in India. After the murders of well known activists in public interest litigation it is a miracle that any employees dare to raise their voice. I hope this article stimulates people to take action. I doubt investigators and regulators care about whistleblowers. The culture of cooperation doesn't exist in this country yet. Just look at our parliament. 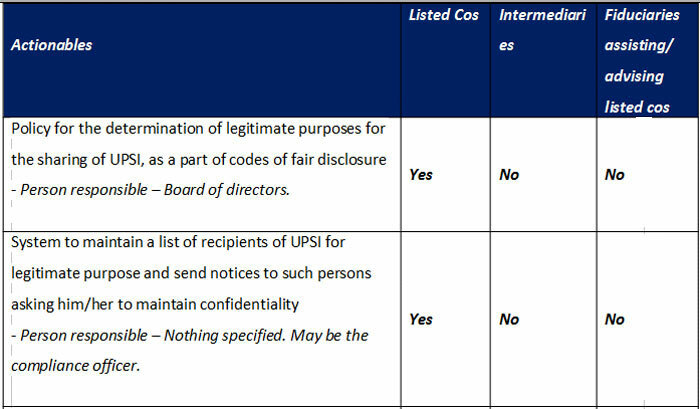 On 31 December 2018, the Securities & Exchange Board of India (SEBI) rationalised the insider trading regulations by segregating the responsibilities of the listed entities, intermediaries and the fiduciaries in line with the recommendations made by the TK Vishwanathan Committee on fair market conduct. The amendments take effect from 1 April 2019. Considering it leaves fewer than 90 days in hand, it is crucial to understand the ‘to do compliances’ for each entity, especially as regards the unpublished price sensitive information (UPSI). 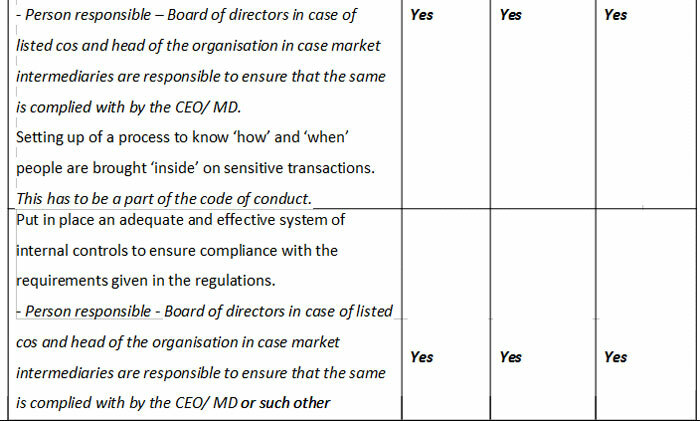 Here is a list of actionables for listed companies and the intermediaries including fiduciaries for ready reference.